The title may be translated as "The Great Tale of the Bharata Dynasty." Traditionally, the Mahabharata is ascribed to the Rishi Vyasa. Due to its immense length, scholars have a long history of attempting to unravel its historical growth and layers of composition. In its final form, it is assumed to have been completed between the third and fifth centuries C.E., with its central core (consisting of only a fraction of the full 1.8 million words) going back as far as 500 B.C.E. The Mahabharata is of immense religious and philosophical importance in India. It is considered to be part of the Hindu itihasas, literally "that which happened," or sacred history. In particular, the Mahabharata is famous for including Hinduism's most widely read scripture today, known as the Bhagavadgita. With its vast philosophical depth and sheer magnitude, a consummate embodiment of the ethos of not only India but of Hinduism and Vedic tradition, the Mahabharata's scope and grandeur is best summarized by one quotation from the beginning of its first parva (section): "What is found here, may be found elsewhere. What is not found here, will not be found elsewhere." In its scope, the Mahabharata is more than simply a story of kings and princes, sages and wisemen, demons and gods; its legendary author, Vyasa, said that one of its aims is elucidating the four Purusarthas (goals of life): Kama (pleasure), artha (wealth), dharma (duty), and moksha (liberation). The story culminates in moksha, believed by many Hindus to be the ultimate goal of human beings. Karma and dharma also play an integral role in the Mahabharata. It is undisputed that the full length of the Mahabharata has accreted over a long period. The Mahabharata itself (1.1.61) distinguishes a core portion of 24,000 verses, the Bharata proper, as opposed to additional "secondary" material, and the Ashvalayana Grhyasutra (3.4.4) makes a similar distinction. Not unlike the field of Homeric studies, research on the Mahabharata has put an enormous effort into recognizing and dating various layers within the text. The first testimony of the existence of the full text is the copper-plate Inscription of the Maharaja Sharvanatha (533–534 C.E.) from Khoh (Satna District, Madhya Pradesh), describing the Mahabharata as a "collection of 100,000 verses" (shatasahasri samhita). The redaction of this large body of text was carried out after formal principles, emphasizing the numbers 18 and 12. The addition of the latest parts may be dated by the absence of the Anushasana-parva from MS Spitzer, the oldest surviving Sanskrit philosophical manuscript dated to ca. 200 C.E., that contains among other things a list of the books in the Mahabharata. From this evidence, it is likely that the redaction into 18 books took place in the third or fourth century C.E. An alternative division into 20 parvas appears to have co-existed for some time. The division into 100 sub-parvas (mentioned in Mbh. 1.2.70) is older, and most parvas are named after one of their constituent sub-parvas. The Harivamsha consists of the final two of the 100 sub-parvas, and was considered an appendix (khila) to the Mahabharata proper by the redactors of the 18 parvas. According to Mbh. 1.1.50, there were three versions of the epic, beginning with Manu (1.1.27), Astika (1.3, sub-parva 5), and Vasu (1.57), respectively. These versions probably correspond to the addition of one and then another "frame" settings of dialogues. The Vasu version corresponds to the oldest, without frame settings, beginning with the account of the birth of Vyasa. The Astika version adds the Sarpasattra and Ashvamedha material from Brahmanical literature, and introduces the name Mahabharata and identifies Vyasa as the work's author. The redactors of these additions were probably Pancharatrin scholars who according to Oberlies (1998) likely retained control over the text until its final redaction in the third or fourth century C.E. Mention of the Hunas in the Bhishma-parva appears to imply that the compilation of the text was still ongoing in 400 C.E. The Adi-parva is dedicated to the snake sacrifice (sarpasattra) of Jayamejaya, explaining its motivation, detailing why all snakes in existence were intended to be destroyed, and why in spite of this, there are still snakes in existence. This sarpasattra material was often considered an independent tale added to a version of the Mahabharata by "thematic attraction" (Minkowski 1991), and considered to have particularly close connection to Vedic (Brahmana literature), in particular the Panchavimsha Brahmana which describes the Sarpasattra as originally performed by snakes, among which are snakes named Dhrtarashtra and Janamejaya, two main characters of the Mahabharata's sarpasattra, and Takshaka, the name of a snake also in the Mahabharata. The Shatapatha Brahmana gives an account of an Ashvamedha (the horse sacrifice) performed by Janamejaya Parikshita. The historicity of the events of the story is unclear. Many historians believe it to be a work of fiction. The epic's setting certainly has a historical precedent in Vedic India, where the Kuru kingdom was the center of political power in the late second and early first millennia B.C.E. According to the Puranas, there is a time gap of 1,015 or 1,500 years between Parikshit's birth during the Mahabharata war and the coronation of king Mahapadma Nanda (ca. 364–382 B.C.E.). The epic employs the "tale-within-a-tale" structure popular in many Indian religious and secular works. It is recited to the King Janamejaya by Vaishampayana, a disciple of Vyasa. The epic is traditionally ascribed to Maha Rishi Veda Vyasa, who is one of the major dynastic characters within the epic. 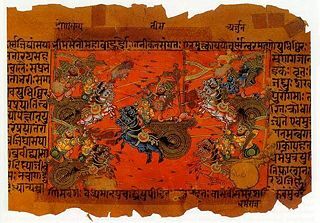 The first section of the Mahabharata states that it was Ganesha who, at the behest of Vyasa, fixed the text in manuscript form. Lord Ganesha is said to have agreed, but only on the condition that Vyasa never pause in his recitation. Vyasa then put a counter-condition that Ganesha understand whatever he recited, before writing it down. In this way Vyasa could get some respite from continuously speaking by saying a verse that was difficult to understand. This situation also serves as a popular variation on the stories of how Ganesha's right tusk was broken (a traditional part of Ganesha imagery). This version attributes it to the fact that, in the rush of writing, the great elephant-headed divinity's pen failed, and he snapped off his tusk as a replacement in order that the transcription not be interrupted. An important character in the Mahabharata is Bhishma, the son of Shantanu (the king of Hastinapur) and the goddess Ganga. It is said that Shantanu wanted to marry Satyavati, the daughter of a fisherman, but the fisherman would not agree to the marriage since he was not assured of the status of his daughter's offspring in the royal family. So the fisherman asked Shantanu to promise that his grandson should ascend to the throne of Hastinapur. In order to please his father, Bhishma vowed to become a lifelong celibate, so that Satyavati's son could be the king. Such a vow was unheard of amongst warrior dynasties, thus inspiring the name Bhishma—"the person of the terrible oath." It was because of this oath that Bhishma fought against the Pandavas in spite of supporting them ideologically. Bhishma realized that as long as he was alive, the Pandavas would not be able to overcome the Kauravas. Therefore he told Yudhisthira the secret of his death. Satyavati's sons died young and her grandson Pandu ascended to the throne because his elder brother Dhritarashtra was blind. However, Pandu was cursed by a sage (whom he accidentally killed while he was in union with his wife), saying that he could never engage in sexual congress with any woman. He retired to the forest along with his two wives. Using a magical spell to summon the gods Dharmaraja, Vayu, and Indra, his elder queen Kunti gives birth to three sons, Yudhishthira, Bhima, and Arjuna through their respective "fathers." His younger queen, Madri, bears the twins Nakula and Sahadeva through the Ashwini twins. Pandu and Madri cannot resist temptation, and die in the forest and Kunti returns to Hastinapura with her sons. The rivalry between the Pandavas and the Kauravas starts from childhood itself. Dhritarashtra’s sons, the Kauravas, led by the eldest Duryodhana, detest their cousins. However, they were the favorite of their teacher Drona and (the Pandavas) grow up to be exceptional. Each one of the Pandavas is said to have one exceptional strength or virtue: Yudhishthira is the wisest and most virtuous, Arjuna the bravest warrior, Bhima the strongest, and the twins Nakula and Sahadeva are endowed with exceptional beauty. When the princes come of age, a tournament is held to display the strength and specialties of the princes of Hastinapur. When Arjuna was hailed as a master of archery, a young man challenges him to a duel. He declares his name is Karna, and that he is the son of the charioteer. When asked to prove that he is of royal birth, which is the criterion for joining the tournament, Duryodhana, spotting a potential ally, jumps over to his side and gives Karna his kingdom of Angawardana. Karna is forever grateful for this act and he becomes Duryodhana's closest friend and plays a crucial role in the upcoming war. Meanwhile Duryodhana plots to get rid of the Pandavas and tries to kill them secretly by burning their palace which is made of lac. However, the Pandavas are warned and escape from the palace. They live in hiding for some time. In the course of this exile Arjuna wins the hand of the Panchala princess Draupadi. When he returns with his bride, Arjuna goes to his mother to show her his prize, exclaiming, "Mother, see what I have won!" Kunti, not noticing the princess, tells Arjuna that whatever he has won must be shared with his brothers. To ensure that their mother never utters a falsehood even by mistake, the brothers take her as a common wife. All of the Pandavas love Draupadi dearly. In some interpretations, Draupadi alternates months or years with each brother. At this juncture they also meet Krishna, a close friend of Draupadi, who would become their lifelong ally and guide. Duryodhana, who now has a friend in the warrior Karna, resigns himself to the coming back of the Pandavas with their new royal ally. Soon they conquer the whole of India and its adjoining regions and Yudhishthira is crowned the emperor. This proves too much for Duryodhana who feels death would be better than watching one's foes prosper. His maternal uncle Shakuni, convinced that however brave his nephew may be, he was no match for his cousins, decides to use a ruse to destroy the Pandavas. He forces Dhritarashtra to invite the Pandavas for a game of dice in which he wins everything from Yudhishthira, including himself, his brothers, and Draupadi through the use of a trick. The jubilant Kauravas insult them in their helpless state and even try to disrobe Draupadi in front of the entire court. Her honor is saved by the grace of Krishna. When the elders intervene and Dhritarashtra has to restore everything to the Pandavas, Shakuni forces another game of dice which he again wins. The Pandavas are required to go into exile for 13 years, and on the thirteenth year they must remain hidden. If discovered by the Kauravas, they will be forced into exile for another 13 years. When the Pandavas after many hardships and exile request at least five villages for the five brothers from their vast kingdom, Duryodhana refuses to give in. Krishna goes to broker peace but fails. War is inevitable. The two sides summon vast armies to their aid and line up at Kurukshetra for a war. The kingdoms of Dwaraka, Kasi, Kekaya, Magadha, Matsya, Chedi, Pandya, the Yadus of Mathura, and some other clans like the Parama Kambojas from Transoxiana were allied with the Pandavas; the allies of the Kauravas comprised the kings of Pragjyotisha, Anga, Kekaya (Kekaya brothers who were enemies of the Kekeya brothers on the Pandava side), Sindhudesa (including Sindhus, Sauviras, and Sivis), Mahishmati, Avanti in Madhyadesa, Madras, Gandharas, Bahlikas, Kambojas (with Yavanas, Sakas, Tusharas, etc. ), and many others. Seeing himself facing grandsire Bhishma and his teacher Drona on Duryodhana's side due to their vow to serve the state of Hastinapur, Arjuna is heartbroken at the idea of killing them. Krishna, who has chosen to drive Arjuna's chariot, wakes him up to his call of duty in the famous Bhagavadgita section of the epic. Though initially sticking to chivalrous notions of warfare, the Kauravas and Pandavas soon descended into dishonourable warfare. At the end of 18 days of slaughter only the Pandavas and Krishna survive with a few old warriors from the Kaurava side. Krishna counsels Arjuna, beginning with the tenet that the soul is both eternal and immortal. Any "death" on the battlefield would involve only the shedding of the body, but the inner soul is permanent. Krishna goes on to expound on the yogic paths of devotion, action, meditation, and knowledge. Fundamentally, the Bhagavad Gita proposes that true enlightenment comes from growing beyond identification with the Ego, the "False Self," and that one must identify with the Truth of the immortal Self (the soul or Atman). Through detachment from the material sense of Ego, the Yogi, or follower of a particular path of Yoga, is able to transcend his illusory mortality and attachment to the material world and enter the realm of the Supreme. The Gita addresses the discord between the senses and the intuition of cosmic order. It speaks of the Yoga of equanimity, a detached outlook. The term Yoga covers a wide range of meanings, but in the context of the Bhagavad Gita, describes a unified outlook, serenity of mind, skill in action, and the ability to stay attuned to the glory of the Self (Atman), which is of the same essence as the basis of Being (Brahman). According to Krishna, the root of all suffering and discord is the agitation of the mind caused by selfish desire. The only way to douse the flame of desire is by simultaneously stilling the mind through self discipline and engaging oneself in a higher form of activity. However, abstinence from action is regarded as being just as detrimental as extreme indulgence. According to the Bhagavadgita, the goal of life is to free the mind and intellect from their complexities, and to focus them on the glory of the Self, by dedicating one's actions to the divine. This goal can be achieved through the Yogas of meditation, action, devotion, and knowledge. Put simply, Bhakti Yoga is Service in Love and Devotion to God (Krishna in the context of the Bhagavadgita). Karma Yoga is essentially Acting, or doing one's duties in life as per his/her dharma, or duty, without concern for results—a sort of constant sacrifice of action to the Supreme. It is action done without thought of gain. In a more modern interpretation, it can be viewed as duty-bound deeds performed without letting the nature of the result affect one's actions. It is said that the results can be of three types—as aimed for, opposite of what is aimed for, or a mixture of these. If one can perform his duties (as prescribed in the Vedas) without any anticipation of the result of his actions, he is bound to succeed. It includes, but is not limited to, dedication of one's chosen profession and its perfection to God. It is also visible in community and social service, since they are inherently done without thought of personal gain. Krishna advocates Nishkam Karma Yoga (the Yoga of Selfless Action) as the ideal path to realize the Truth. Allocated work done without expectations, motives, or thinking about its outcomes tends to purify one's mind and gradually makes an individual fit to see the value of reason and the benefits of renouncing the work itself. In order to achieve true liberation, it is important to control all mental desires and tendencies to enjoy and sense pleasures. Jnana Yoga is a process of learning to discriminate between what is real and what is not, what is eternal and what is not. Raja Yoga is the stilling of the mind and body through meditation techniques, geared at realizing one's true nature. This practice was later described by Patanjali in his Yoga Sutras. During the discourse, Krishna also reveals his identity as the Supreme Being Himself, blessing Arjuna with an awe-inspiring glimpse of His divine absolute form. The Bhagavadgita refers to the war as "Dharma Yuddha," meaning a just war. Chapter 4, verse 7, clearly states that God takes incarnation to establish righteousness in the world. Beholding the carnage, the noble mother of the Kauravas, Gandhari who had lost all her sons, curses Krishna to be a witness to a similar annihilation of his family, for though divine and capable of stopping the war, he had not done so. Krishna, who had incarnated precisely to destroy the wicked kings, accepts the curse, which bears fruit 36 years later. He then departs from the world. The Pandavas who had ruled righteously all along, now tired, decide to renounce everything. Clad in skins and rags they retire to the Himalayas and ascend the peaks towards heaven in their bodily form. Legend reveals that a stray dog travels along with them. One by one the Pandavas and Draupadi fall on their way. As each one falls, Yudhishtra gives the rest the reason for their descent (Draupadi was partial to Arjuna, Nakula and Sahadeva were vain and proud of their looks, Bhima and Arjuna were proud of their strength and archery skills, respectively). Only the virtuous Yudhisthra, who had tried everything to prevent the carnage, and the dog remain. The dog reveals himself to be the god Yama, who reveals the nature of the test and assures Yudhishtra that his fallen siblings and wife are in heaven. Yudhistra alone transcends to heaven in his bodily form for being just and humble. Arjuna's grandson Parikshita rules after them and dies after being bitten by a snake. His furious son, Janamejaya, decides to perform a snake sacrifice (sarpasattra) in order to destroy the snakes. It is at this sacrifice that the tale of his ancestors is narrated to him. In the late 1980s, the Mahabharata was televised and shown on India's national television (Doordarshan), directed by B. R. Chopra and his son Ravi Chopra. It became the most popular Indian TV series in history. When the Mahabharata was first broadcast in India, it shattered television records by reaching 97.8 percent viewership there. It also entered the Guinness Book of World Records as having been watched by over 96 percent of the worldwide Indian population. It was also shown in the UK by the BBC, where it achieved audience figures of 5 million, unheard of for a subtitled series being aired in the afternoon. In the West, the most acclaimed and well-known presentation of the epic is Peter Brook’s nine-hour play which premiered in Avignon in 1985 and its five-hour movie version (1989), which was shown on other TV networks, including PBS (through the "Great Performances" show) and Danmarks Radio (credited in the movie's credits). However, there have been film versions of the Mahabharata long before these two versions, the earliest of which was shown in 1920. A 2013 animated adaptation holds the record for India's most expensive animated film. There is also a film version planned for release in 2020, which has the largest budget ever in the Indian film industry. Between 1919 and 1966, the scholars at the Bhandarkar Oriental Research Institute, Pune, compared the various manuscripts of the epic from India and abroad and produced the Critical Edition of the Mahabharata, 13,000 pages in 19 volumes, followed by the Harivamsha in another two volumes and six index volumes. This is the text that is usually used in current Mahabharata studies for reference. An English prose translation of the full epic is in progress, published by University of Chicago Press, initiated by Chicago Indologist J. A. B. van Buitenen (parvas 1–5) and after his death continued by D. Gitomer of DePaul University (parvas 6–10), J. L. Fitzgerald of Tennessee University (parvas 11–13), and W. Doniger of Chicago University (parvas 14–18). Another translation into English, entirely done by P. Lal, a verse-by-verse rendering which is the only one to include all slokas in all recensions of the work (not just those in the Critical Edition), is currently being published by Writer's Workshop, Calcutta. However, the standard translation is the one done at the beginning of the twentieth century by Kisari Mohan Ganguli. The complete text is available online. ↑ Bhārata means the progeny of Bharata, the king believed to have founded the Indian kingdom of Bhāratavarsha. ↑ The Ashvamedhika-parva is also preserved in a separate version, the Jaimini-Bharata (Jaiminiya-ashvamedha) where the frame dialogue is replaced, the narration being attributed to Jaimini, another disciple of Vyasa. This version contains far more devotional material (related to Krishna) than the standard epic and probably dates to the twelfth century. It has some regional versions, the most popular being the Kannada one by Devapurada Annama Lakshmisha (sixteenth century). ↑ Placing the Kurukshetra battle at 3137 B.C.E. and the death of Krishna and the beginning of the Kali Yuga at 3102 B.C.E. ↑ For example, October 16, 5561 B.C.E., calculated by V. Vartak, Scientific Dating Of Mahabharata War, Ramayana & Vedas. Retrieved January 22, 2018. ↑ K. D. Sethna, Problems of Ancient India (New Delhi: Aditya Prakashan, 2000, ISBN 8177420267), 58. ↑ "Mahabharat" TV-Series 1988–1990—IMDb entry. Retrieved January 22, 2018. ↑ "The Mahabharata" (1989) (mini)—IMDb entry. Retrieved January 22, 2018. ↑ Mahabharat (1920)—IMDb entry. Retrieved January 22, 2018. ↑ Mahabharat (2013)—IMDb entry. Retrieved January 22, 2018. ↑ Mahabharata: Part 1 (2020)—IMDb entry. Retrieved January 22, 2018. ↑ Bhandarkar Institute, Pune—Virtual Pune. Retrieved January 22, 2018. The latest translation published in 2006 by R. V. Bhasin (national publications) who also authored "Essence of Hinduism" (Jaico publications). Brockington, J. 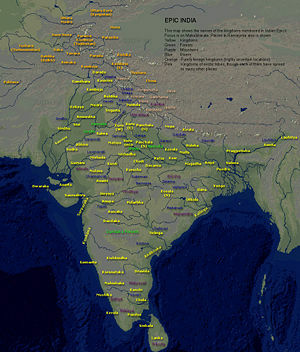 The Sanskrit Epics. Leiden, 1998. Hopkins, E. W. The Great Epic of India. New York, 1901. Mehta, M. "The Problem of the Double Introduction to the Mahabharata." JAOS 93(1973): 547–550. Minkowski, C. Z. "Janamehayas Sattra and Ritual Structure." JAOS 109 (1989): 410–420. Minkowski, C. Z. "Snakes, Sattras and the Mahabharata." In Essays on the Mahabharata, ed. A. Sharma. Leiden, 1991, 384–400. Oberlies, Th. "Ritual an und unter der Oberfläche des Mahabharata." In Neue Methoden der Epenforschung (ed. H. L. C. Tristram). Freiburg, 1998. Oldenberg, Hermann. Zur Geschichte der Altindischen Prosa. Berlin, 1917. Oldenberg, Hermann. Das Mahabharata. Göttingen, 1922. Utgikar, N. B. "The Mention of the Mahabharata in the Ashvalayana Grhya Sutra." Proceedings and Transactions of the All-India Oriental Conference, Poona (1919), vol. 2, Poona (1922), 46–61. Witzel, M. "Epics, Khilas and Puranas: Continuities and Ruptures." Proceedings of the Third Dubrovnik International Conference on the Sanskrit Epics and Puranas, ed. P. Koskiallio. Zagreb, 2005, 21–80. All links retrieved January 24, 2018. Numerous readings and adaptations of the Bhagavad Gita's 700 verses are published in many languages. Traditionally the commentators belong to spiritual traditions or schools (sampradaya) and Guru lineages (parampara), which claim to preserve teaching stemming directly from Krishna himself and thus to be most faithful to the original message. It should be kept in mind that different translators and commentators have widely differing views on what multi-layered Sanskrit words and passages truly signify, and their best possible presentation in English depending on the sampradaya they are affiliated to. Especially in Western philology, interpretations of particular passages often do not agree with traditional views. The Mahabharata in Sanskrit (parallel in Devanāgarī and transliterated) at The Internet Sacred Text Archive. Srimad Bhagavad-Gita Overview by Jagannath Das. Complete Vyasa Mahabharata at bharatadesam.com. Full text of the Kisari Mohan Ganguly translation of the Mahabharata at sacred-texts.com (The most complete English translation in the public domain). Devanagri Sanskrit transliterations and Hare Krishna-influenced Sanskrit-to-English translations for all 700 verses. Gita excerpt from the Mahabharata by Kisari Mohan Ganguly (published between 1883 and 1896). Mahabharata and Sindhu- Sarasvathi tradition, a paper by Subhash kak (pdf). Bhagavad Gita with Commentaries by Vladimir Antonov. Essays on Gita by Sri Aurobindo. Verses in Sanskrit, transliteration, Hare Krishna-influenced translations and accompanying chants in Realaudio. Bhagavad Gita Sung in English, in streaming Realaudio. This page was last modified on 24 January 2018, at 16:45.